Every year, young country Victorians from across the state migrate to Melbourne to start new lives and rarely come back. V/Line Australia’s biggest regional train operator, wanted to increase visitation rates from the city to the country. These new to Melbourne Victorians would still have strong ties to the country, but the lure of the big city lights was pulling them the other way. We weren’t asking people to simply take a V/Line train trip, we we’re asking them to leave their new lives, their new friends and get on a V/Line train to travel hundreds of kilometres to see someone they otherwise weren’t planning on seeing. To do this we needed to give people a reason to go back to the country. V/Line knew that they weren’t asking their target to make a rational decision and that the solution needed to be functional and emotional. The solution to the business problem wasn’t to advertise the trains, but rather create a new product that delivered a brand new, highly functional product delivered through one of the most powerful emotional lenses. Guilt. The idea was simple, the Guilt Trip. 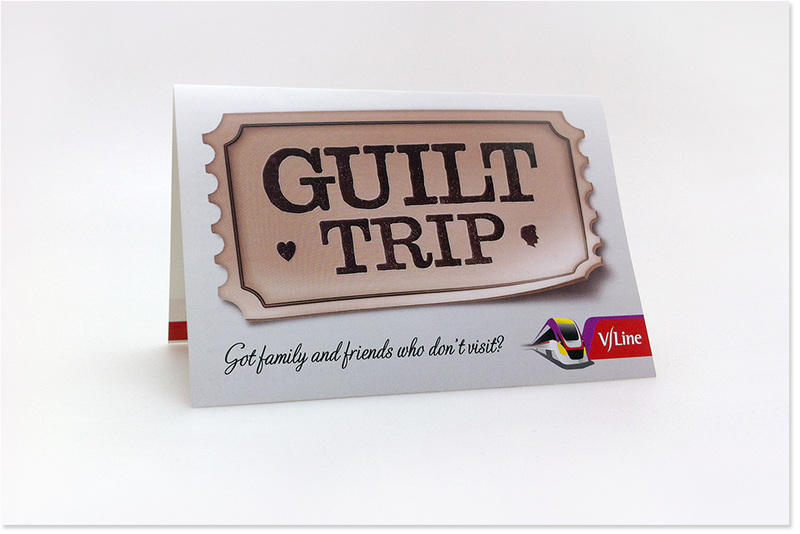 The Guilt Trip was a new ticket which came with all the tools mums needed to guilt their kids into visiting them. Traditional media and public relations were used to kick the campaign off, with the State’s Transport Minister launching the campaign. The idea that it was now possible to purchase a Guilt Trip was novel enough to gain great traction in regional press and television networks. 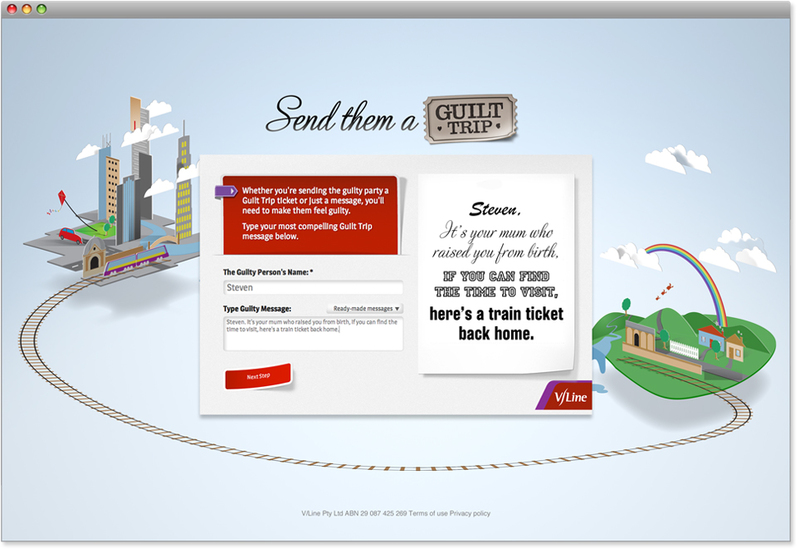 A pre-paid train ticket sent to family and friends from the Guilt Trip website. Paid outdoor, press also brought the idea to life and guilted young people to return home to visit their friends, and families. A dedicated website designed to create tailor made guilt inducing messages to family friends. You could write your own message or select one from a list. You could also buy a Guilt Trip ticket to ensure a visit from a loved one. The Guilt Trip platform was also designed to allow users to very publically, guilt their family and friends to come home – through Facebook and Twitter. Expert videos in the art of guilting family and friends back home. March 12, 2019 | Filed under Folio.